PRICE REDUCED: The boat is fully equipped and has been professionally maintained. New bottom paint every 2 years -- last done October 2015. All new running rigging May 2016 and winches serviced May 2016. From Hunter’s Promotional Materials: Whether you are ready to set sail for the islands or just around the buoys, the Hunter 36 can really make a difference. The Hunter 36 is equipped with a tall B&R fractional rig which is engineered to carry less weight aloft with smaller sections. This is accomplished by utilizing swept-back spreaders and reverse diagonals as well as mast support struts. This combination provides superior strength without a backstay. 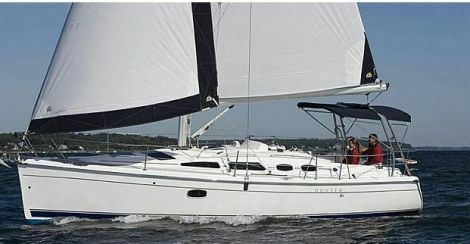 By using a large main as the power sail, Hunter has eased the effort in sail handling and allowed for real versatility for all wind and sea conditions. Your benefit: better performance with less effort. The deck layout reflects the innovation that accompanies the rig. An integrated stainless steel arch protects the cockpit from snapping main sheets and the integrated bimini provides protection from the sun. The knotmeter, depth, and wind gauges along with the auto-pilot are mounted on a custom console at the helm. Single lever control along with engine instrumentation complete the command station. The swim platform and walk-through transom complete with shower and folding ladder are perfect for water sports or for boarding the tender. Storage is everywhere you look and the non-skid is absolutely first-rate. Comfort is truly important aboard whether for a week or a year, so Hunter has created an interior that not only looks good, but works for you as well. Two private, large staterooms along with an enormous head with shower and a salon that can seat eight plus a gourmet galley will keep all the crew happy. Lightly day sailed on the St Johns River with a couple trips to St. Augustine and Fernandina. If you are serious about buying a mid size cruiser, you need to take a look. Call me at 904-four one two-6387. No brokers and I don't respond to text messages.